So, I have to start this by saying I am a HUGE fan of Psych, and that Shawn and Gus are one of my OTPs of all time (yeah, I'm a sucker for the bromance). But this post will be separate from that. 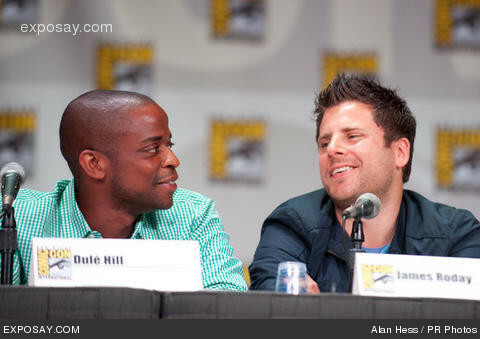 Last year, I got to go to SDCC, and was able to see James and Dule live and in living color. They are two really fabulous guys, and I adore them as well (which is good...such a disappointment to find out someone who plays one of your fave characters is a douche). They were nearly the same on the panel as they are on screen, and just a general joy to listen to (and the songs!). I got over my nerves, and voila! Also, if you get the chance, check out some clips I got from this year's panel.